This weekend brought the release of a classic model to NikeID (www.nikeid.com). The Nike Air 180 is a retro runner that gets a lot more attention in Europe than the United States. Originally released back in 1991 the 180 Air features 180 degrees of air bag going from the sides of the midsole and under the bottom of the shoe. While I have never owned a pair I have been drooling over the Euro only releases for years. The NikeID released version offers lots of great material options such as suede, perf leather, and ripstop nylon as well as the runner standard mesh. Color options include most of your basic pantones and the ever popular splatter design on the midsole. 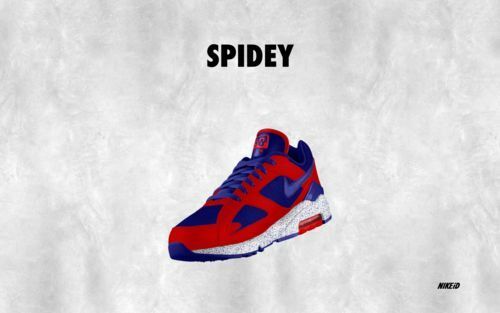 I love playing around on NikeID and decided to design a Spiderman inspired model. Think you can do better? Head over to NikeID to design your own today!